Anna University will allow their students to check the even semester exam results without entering the date of birth , meaning that you can only enter Register Number to see your results. Using this method you can see your friends result, this process is faster and easy. In this Post We will Guide Al the Students How to Check Anna University Results Without Date Of Birth, Yes you can Check All Anna University UG/PG Results/Internal Marks Only with the help of Register Number and without DOB for all year 1st, 2nd, 3rd, 4th, 5th, 6th, 7th and 8th semester at www.annauniv.edu, Coe1.annauniv.edu , sdpdr.nic.in. This Guide will be Helpful because when anna university announces the Nov/Dec/Jan sem results, all the students will check their results on www.annauniv.edu or Coe1.annauniv.edu by entering Date of Birth. And many students will also want to know their Friends/Classmate Results also. At that time they will not know their DOB, So they fail to check their Friends/Classmate results. Currently There are Two methods available to Check All Anna University UG/PG Results/Internal Marks Without DOB, Check below those Two Methods..
Before 2-3 years ago there was no portal to check internal marks, electives and last semester results. At the end of the semester only students were able to know their internal marks, that too by their class faculties only. But Now Anna University CEO Has launched a new website/apps to check the internal marks periodically, last semester marks, electives, final internal marks, etc... Now Anna University created a student’s login portal to check their elective, internal marks, results, exam timetable and chosen electives by them. You can Use sdpdr.nic.in Website To Check the Results without Date of Birth (DOB) sdpdr.nic.in/annauniv - Student's Corner Portal for all details. 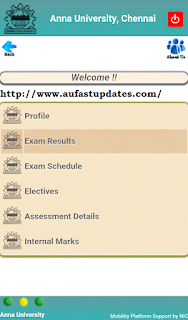 It is one of the Web App sites for all Mobile Devices running by Anna university for helping the students to get Details about UG/PG Results/Internal Marks. In this method you Must have Android Smartphone, Yes Anna university has released official Student's Corner Portal Android Application for all details related Check All Anna University UG/PG Results/Internal Marks Without DOB. How to Check Anna University Results 2018 Faster and Easily? 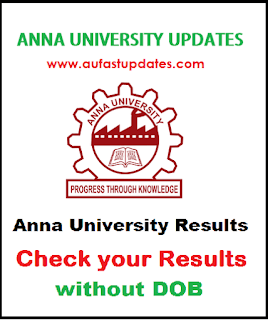 1) Download Anna University Result 2018 App from Here[APK Format, Supports Android OS/Laptop Only]. 2) After that Install Anna University App on your Android Phone. 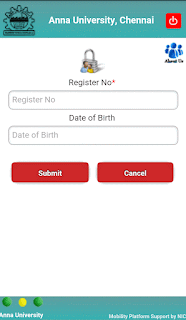 3) Now Open Anna University App and wait untill you see Enter Your Details Screen. 4) Enter Your Register Number Only, you need not to enter Date of Birth. So it makes you more faster. 5) Now after logging in to your account, scroll up and click on Results Option. 6) Within Few Seconds your Results will be displayed. By Using these two Methods you can check all the Details Like, Your Profile, Semester Exam Results, Semester Examination Schedule, Assessment Details of a Student, Elective tab from 6th semester onwards and the Absentees and Internal Mark Details - after each internal assessments- period wise, final internal marks for 20 marks. Your parents can also able to check their son or daughter’s internal marks, exam results using this Anna university students login portal. .